Queen of the Most Holy Rosary Chapel, built by Fr. John Curran, OP, was relocated to the grounds of Rosaryville Spirit Life Center in 2014. Now you can be a part of creating a brick walkway leading to this sacred shrine. Customized bricks may be engraved with your name or business, family, friend or in memory of a loved one. In 1940, an Irish Dominican priest, Fr. John L Curran, OP, was serving in the Ponchatoula area. When World War II began, he became a military chaplain. He was taken as a prisoner of war and survived the notorious Bataan Death March. During the March he went to extraordinary lengths to secretly provide worship and hope for his companions. He made a pledge that if he survived, he would erect a chapel honoring the Mother of God. Fr. Curran did survive and, upon returning to the area, he began construction of Queen of the Most Holy Rosary Chapel with the help of friends and neighbors. 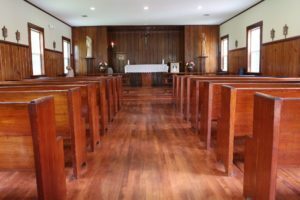 Built of cypress, even using donated railroad trestles from the Manchac bridge, the chapel provided Manchac residents a place to worship and celebrate. Over the years weather and age took their toll on the chapel. The Pugh family, friends of Fr. Curran, moved, restored and safeguarded the chapel on their land in south Ponchatoula. 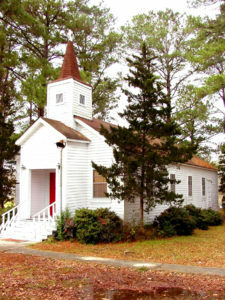 In 2014 the chapel was relocated to the Rosaryville grounds, thanks to the generosity of the Pughs. Here it will serve those who come to the retreat center seeking serenity and peace.